Manchester United have started off this season flying on all cylinders and every single player seems to be clicking as they have now marched to back to back 4-0 wins to start this season. The first of these impressive wins came at the expense of Slavan Bilic’s West Ham United. Bilic’s new-look side included experienced Premier League players like Joe Hart and Pablo Zabaleta yet the Red Devils rolled them over without any difficulty at all. Manchester United ran circles around the Hammers, exhausted them to a breaking point and then capitalized on their sloppiness and slowness in defense with three late goals. It was a similar story on Saturday when the Red Devils charged to a 4-0 victory over Swansea City. The Swans held United for a long period of time in the match but when Martial came on, the game completely changed and it went from bad to worse very quickly for Paul Clement’s side. A 1-0 score-line going into the 79th minute quickly became an embarrassing defeat as Mourinho’s very fit Manchester United surged on to score three more goals in a matter of minutes. Henrikh Mkhitaryan and Paul Pogba have battled for man of the match in both contests. Both look so much more free this season and both look to finally be playing where they want to play and in a style that suits their games. Mkhitaryan’s play-making abilities have been on full display in the opening two matches as he currently leads the league in assists right now with 4. If he continues on at this rate, he might break 50! Pogba meanwhile has also been brilliant and is finally finishing off the chances that he is creating for himself. Two goals and an assist inside two matches is an amazing start for the man who only achieved 4 and 3 in the entirety of last season. The singing of Matic has been immense for the two of them and for the entire team for that matter as the way he holds back and breaks up play allows every other player in attack to do what they do best and cause damage to the opposition. Ander Herrera filled a similar role last season but it’s safe to say Matic has given this side an instant lift that the Spaniard could have never achieved. The signing of Romelu Lukaku has also been undoubtedly key as not only has he been clinical in front of goal, he’s also allowed Marcus Rashford and the aforementioned Pogba and Mkhitaryan to get on the ball more and cause more damage in the attacking third. The Belgian’s link-up play is superb and his movement from left to right allows clever players like Martial and Mkhitaryan to find those pockets of space and create something for their teammates. We also can’t forget that he is currently the league’s leading scorer with three goals in two matches. The entire squad have just responded brilliantly. Anthony Martial hasn’t moaned and groaned about being on the bench one bit and has kept his head up high and let his football on the pitch do the talking. Given United’s lethal scoring record with him on the pitch, it won’t be long before he steals a spot away in the XI for good. It will however be hard to take a place away from the pacey Marcus Rashford who also hasn’t disappointed in the first two matches of the season and the intelligent Juan Mata who just offers United something different that no other player can really bring to the table. Ander Herrera meanwhile was the club’s best player last season without question but has now found himself on the bench with the arrival of big Serbian Nemanja Matic. The Spaniard always has a fantastic attitude and you get the feeling that he loves life not only in Manchester but playing under Mourinho as well and even if he is made to be a squad player this season, he’ll likely still have an important role to play in helping United challenge for the title. Mourinho’s men have always been brilliant in defense as well and that has continued to remain true as the Red Devils have waltzed to 2 clean sheets. Every single player in that back-line looks full of confidence and not just that, but also desire to win every single ball. Daley Blind has been immaculate in the opening two games of the season at left-back while Eric Bailly and Phil Jones look like a partnership that could be there to stay for years. Antonio Valencia has also upped his game even from last season and by route of wearing the captain’s armband has become an even more important player to Manchester United now. Jose Mourinho’s tactics have been on point this season. His team have kept a large majority of the possession and just exhausted their opposition so much. Then when they reach their breaking point, Mourinho’s men have pounced instantly, scoring for fun and ending the game with ease. In both games the opposing team hardly had a shot on goal as his defense were just so immense at winning absolutely everything before it could even find its way to the keeper. 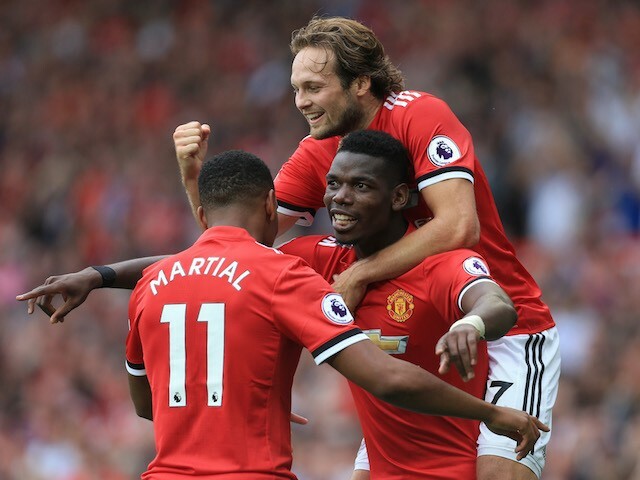 Keeping David De Gea was key in allowing the confidence of the squad to remain sky high but the arrivals of Nemanja Matic and Romelu Lukaku have been the key thing above all else that has seemingly lifted the spirits of every single player and given them new life in the game and in this season. Surely Manchester United won’t win every game 4-0 this season but it has been an incredible start to the season for the Red Devils and one that certainly should have every other team quaking in their boots.